The Central Board of Secondary Education (CBSE) is conducting the Joint Entrance Examination (JEE) Main examination on April 3, April 9 and April 10, 2016. The Joint Entrance Examination (JEE) Main is conducted to short list candidates seeking admission to undergraduate engineering programmes at NITs, IIITs, other centrally funded technical institutions, institutions funded by participating state governments, and several other iInstitutions. 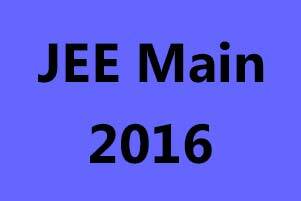 The JEE (Main) exam will consist of two papers: Paper I (BE/B.Tech) and Paper II (B.Arch/B.Planning). These papers can be attempted in pen and paper mode or online mode. These shall be held for a duration of three hours each. 1. Topics such as Vectors and 3D, Probability, Indefinite integration, Complex numbers, and Definite integral require a lot of attention. 2. Differential calculus is another important topic, for which one should specialize in solving roots of equations with the utilization of Rolle's and Lagrange's theorems. 3. One also needs to excel in problems based on Permutation Combination and Probability, as they are essential topics in Algebra. 4. Simplify Integral calculus via using some basic varieties of integrable functions. Try to keep the properties in mind while using them to complete solutions on time. 5. Excelling in Coordinate Geometry depends on proper knowledge of parametric forms of various conic sections. Further, one should be highly capable of converting the tougher parts to these basic forms, which would help in simplification. 6. Practice mathematics as much as you can while taking a cue from previous years' JEE papers. 1. Improve your focus on conceptual clarity, application skills and awareness of the prescribed syllabus. 2. Stress more on topics such as Mole concept, Chemical Equilibrium and Electrochemistry. 3. Practice Organic Chemistry more while improving your hold on topics like Stereochemistry, GOC (General Organic Chemistry) and Functional Group Analysis. 4. Pay extra attention to topics like Chemical Bonding and Coordination Chemistry as they are highly conceptual. A major part of JEE (Advanced) consists of questions related to physics, which makes it an important subject in terms of marks distribution. 1. Scoring topics include Optics, Electricity and Magnetism, etc. 2. Topics requiring extra attention constitute Kinematics and Particle dynamics. These are important parts of Mechanics and are regularly witnessed in JEE papers. 3. According to the general trend, Mechanics and Electricity and Magnetism are the most important topics in terms of the number of questions has been asked in JEE of previous years.